There’s a lot of ways to dress up a main course, but does anything sound better than using a sweet and salty bacon sauce? While these might be a bit hard to find off the shelf, you can easily make a homemade jam with just a handful of ingredients and the patience for this to finish cooking. 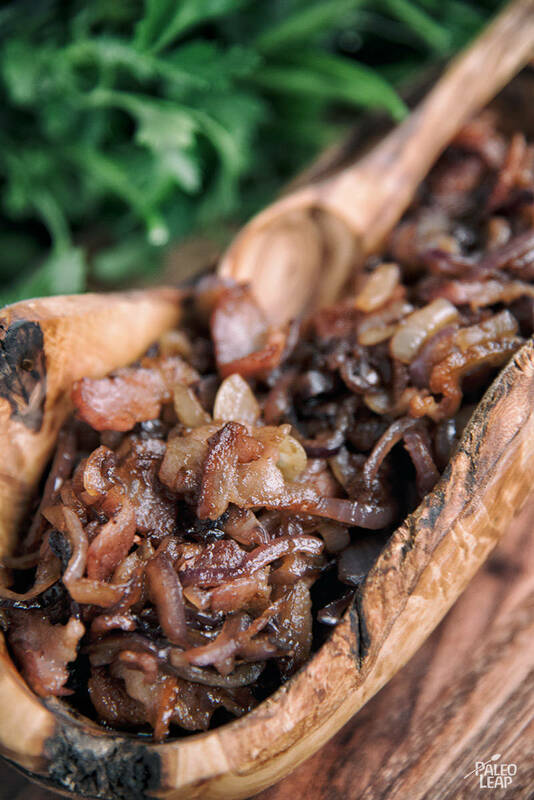 In this recipe, you’ll be combining sweet onions, bacon, honey, balsamic, and a garlic to create this deliciously sweet and unique condiment. The best part about this recipe is the scale-up factor – try making with just the amounts listed below. If you love it, double or triple the batch you make next time and freeze in smaller servings to use in future recipes. The main star of this recipe is a tried and true favorite – bacon! This versatile ingredient has made a come-back even in non-Paleo diets, appearing in things as varied as milkshakes, batters, and protein wraps. We enjoy bacon for a lot of reasons, number one being the salty and hearty flavor it adds to any dish. However, bacon also has a bit of a reputation as being a not-so-great food, specifically due to the processing required to make this product. While there are a few things about bacon that aren’t great for us, we still think that it is fine it to eat in moderation. Now that you’re committed to making this jam, what should you serve it with? While it might be tasty enough to eat straight out of a bowl, we don’t advise imbibing to that extent. Try using this to accompany a poultry dish or serving on top of a traditional burger recipe. Add the bacon to a skillet and cook over medium heat until crispy. Set the bacon aside and discard any excess bacon fat, reserving 2 tbsp. in the skillet. Reduce heat to low and add the onion to the skillet; cook 8 to 10 minutes, stirring occasionally. Pour in the raw honey and cook another 10 to 12 minutes, stirring until caramelized. Drizzle in the balsamic vinegar and cook, stirring every 4 to 5 minutes for another 15 to 20 minutes. Add in the bacon, toss everything, and cook another 4 minutes. Serve over red meat or chicken.